One key to packing light is being willing to wash a few clothing items on your trip so you don’t have to pack as much in the first place. Yes, hotels offer laundry services, and some even have coin-operated machines guests can use. But since we’re the Fiercely Frugal Savage Sisters, we’ll discuss the most economical method of all: washing your own clothes by hand. Stockings and undies are obvious candidates for this type of laundering, but you can also wash shirts that got spattered by maple syrup at breakfast or you can clean slacks bearing park-bench smudges. Generally, outer clothing items can be worn more than once between launderings. Some travelers like to air out their clothing or keep a few dryer sheets in their bags for a fresher-smelling wardrobe. According to Rick Steves of Europe Through the Back Door, most European hotels would rather you didn’t do laundry in your room. Some even post signs in several languages to that effect. Rick says, “Interpret hoteliers’ reticence as ‘I have lots of good furniture and fine floors in this room, and I don’t want your drippy laundry ruining things.’” In his opinion, as long as you wash carefully and are respectful of the room, doing your own laundry is perfectly fine. In this series we’ll cover four important subjects related to doing your own travel laundry. We’ll start the discussion by talking about what to add to the water to get your clothes clean. Powdered laundry detergent – Powdered detergent is sold in little packets, or you can bring your own from home in a sturdy container. Although it can be more difficult to mix into water by hand, most powdered varieties contain whitening agents, which is why some people prefer them over other types of soap. Liquid laundry detergent – The liquid version disperses much more easily in water, but, if you’re using a carryon only, it’s a pain to have to carry through security. 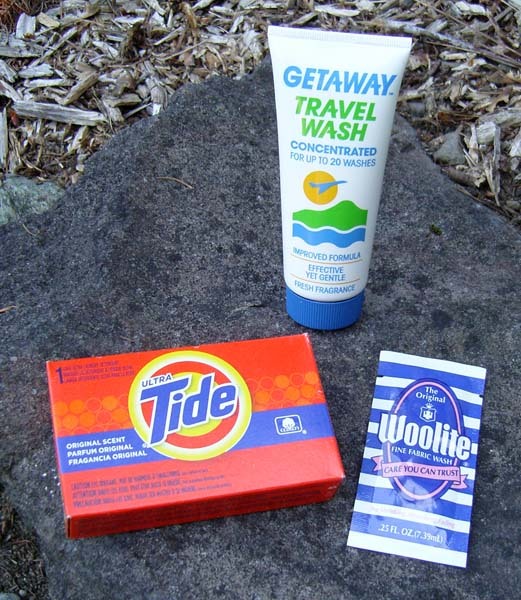 Small packets of national brands, such as Woolite and Tide, are available. Dylon Travel Wash (formerly Getaway Travel Wash) comes in a tube and is preferred by some travelers because it rinses out easily. At home you can decant liquid detergent into a small plastic bottle with a secure, screw-on lid. Always place the packet or bottle inside a sealed zip-top bag to prevent any possible leaks from ruining the rest of your luggage’s contents. Liquid biodegradable all-purpose soap – These biodegradable soaps, such as KD Gold, EO, Campsuds, and Rick Steves’ Travel Wash are sold as the traveler’s solution for everything that needs to be cleaned: body, hair, dishes, clothes… If all you need is soap for laundry, however, the price might make this one of the least-attractive options. And being liquid means you either have to pack it in your checked luggage or include it in your quart-size liquids bag. Laundry soap sheets or wafers – Each about the size of a postage stamp, these biodegradable laundry-soap sheets mix well with water so you can hand-wash clothes in a sink (2–3 sheets) or washing machine (5–8 sheets). Their dry form means you can pack them in your carryon. Not the cheapest way to go, but handy. Laundry bar soap –Popular brands of laundry bar soap include Fels-Naptha, Lirio, Octagon, and Zote. A solid bar doesn’t need to go in your liquids bag, and it also works well for pre-treating stains when you do laundry at home. Shampoo or body wash – Many travelers use hotel-provided body wash or shampoo to wash their clothes. Regular bar soap – A fair number of travelers wash their clothes with hotel bar soap, or they carry their own bar soap and use it for every cleansing need. The disadvantage of beauty-bar soap is that it tends to be difficult to rinse out of fabric completely. Whatever type of cleaning agent you use for hand washables, the laundering method you choose is a crucial element to your success. Fortunately, you have a variety of selections. This entry was posted in Pennywise Packing Pointers and tagged biodegradable, carryon, clothes, detergent, dryer sheets, drying, hair products, laundry, liquid, liquids, luggage, packing, powdered, rinse, shampoo, soap, water. Bookmark the permalink.